Cane Corso - TCane Corso Criador da raça Cane Corso. Our Kennel. Why Cane Corso. The decision of whether to own a dog or not is a very personal one and will depend on a number of factors, like love and dedication to the animal, time, energy, suitable environment and some monetary investment. Once you have decided to own one, the next step is to choose the breed of animal, and this decision has a lot to do with the function that you want the new addition to your home to perform: just company or guard dog or both? At the end of the 1990s, I purchased a country home in Petrópolis, in the mountains of Rio de Janeiro. Despite the initial euphoria that comes with a purchase of this type, (they say that purchasing a country home has two moments of joy: when you buy and when you sell), the matter of security became a huge concern, primarily because my children were still young at the time. No technological contraption that had been recommended (alarms, cameras, electric fences, etc.) was sufficiently convincing. None of these would allow me to sleep peacefully. It was an old friend who gave me some advice after learning about my new purchase and my justified concerns: buy two dogs and forget your troubles. For days, amidst meetings and business trips, I pondered the hitherto unthinkable. A dog? Really? And the indecision didn’t stop there, because my friend complemented this piece of advice with another: the dog has to be balanced, or in other words, good company and an excellent guard of the house. Which breed would meet the apparently mutually exclusive requirements? Since my knowledge about dogs was extremely limited at the time—so as not to say nonexistent—my anxiety regarding the subject only continued to grow. I began to imagine the many different types of situations encountered in a country home: barbecue with friends, children’s parties, teenagers sneaking in and out of the house at night. So how would I ensure the safety of such different groups and at the same time be sure that my dog could coexist peacefully with all of them, as if it were actually a part of each of these groups? The end of the renovation on the house was drawing near, the plans for its inauguration already postponed and I still didn’t have an answer. I researched here and there (at the time Google didn’t exist! ), and contact with people knowledgeable on the subject (veterinarians, trainers, handlers and friends) helped me to gather information. 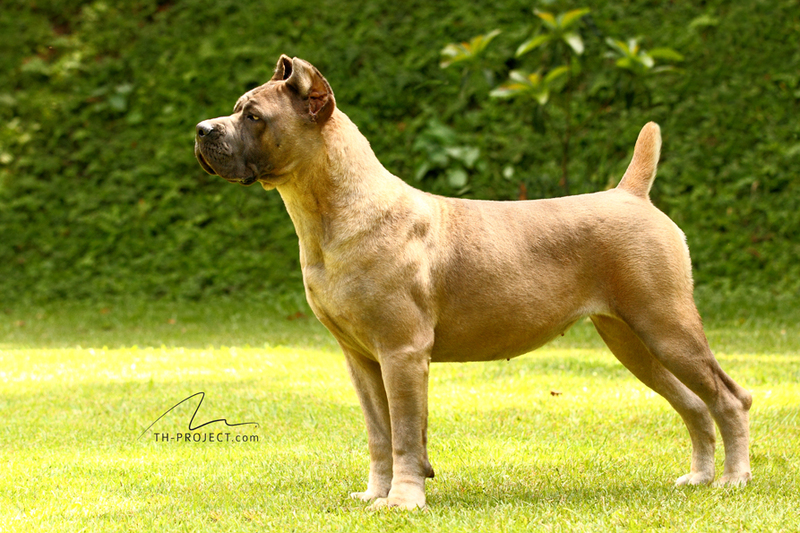 At the end of this process of researching and evaluating the breeds that best fit the desired profile, two possibilities stood out in my mind. I then started on the third phase of the journey: meet in person the strongest candidate for being our family’s dog. 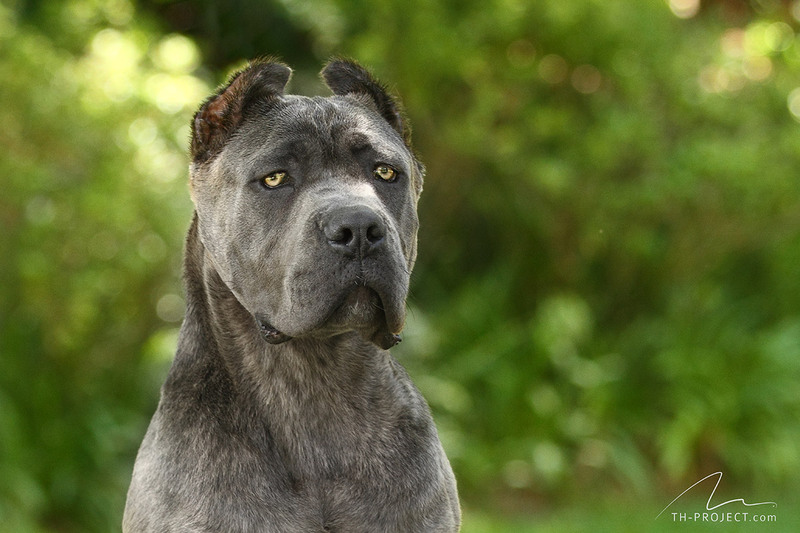 And you never forget the first time you meet a cane corso. After I selected the kennels, I hit the road, but not for long. I was hooked at my very first stop. The first thing the breeder did was show me a black tiger-striped male with yellow eyes. Bull’s-eye. The dog was beautiful, robust and was imposing in some inexplicable way, transmitting both a sense of security and empathy, as if he were convinced that I would fall in love with the breed. But to make sure, I ask the breeder to let him go, since I wanted to test how he reacted to strangers. The animal was docile and affectionate, just as I had expected. I decided to gamble that the information that I had received about this breed’s effectiveness as a guard dog was correct and closed the deal immediately. My puppy was born 30 days later, from a cross between a tiger-striped father and a velvety black mother, chosen from a beautiful healthy litter. But at that time, something unexpected happened. A small black pup with enormous paws and a clever gaze made himself comfortable in my lap. I thought he was cute but I stuck with my choice. I went home with the striped one, but the little black one played on my mind. The following day, I gave in. I returned to pick up Chicão, my guardian angel, to serve as company for Afonso, the striped one, who 12 years later continues to provide me with peaceful nights of sleep with his loyal guard. Afonso and Chicão quickly won over my rambunctious boys, and they would spend the day entertaining themselves with ball games. 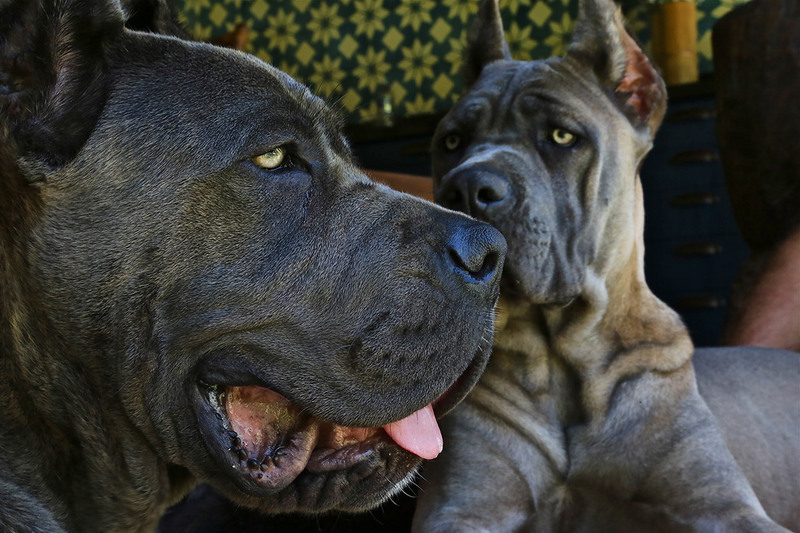 By this created a problem: my girls, adolescents at the time, began to complain that they wanted a cane corso to call their own. I returned to the kennel with the firm conviction that the gamble on the breed was correct, which allowed me to make good on my girls’ request. This is how we ended up with Betina, a beautiful female with deeply tender eyes, who quickly became the star of our home, companion and protector of her owners and top guard dog. 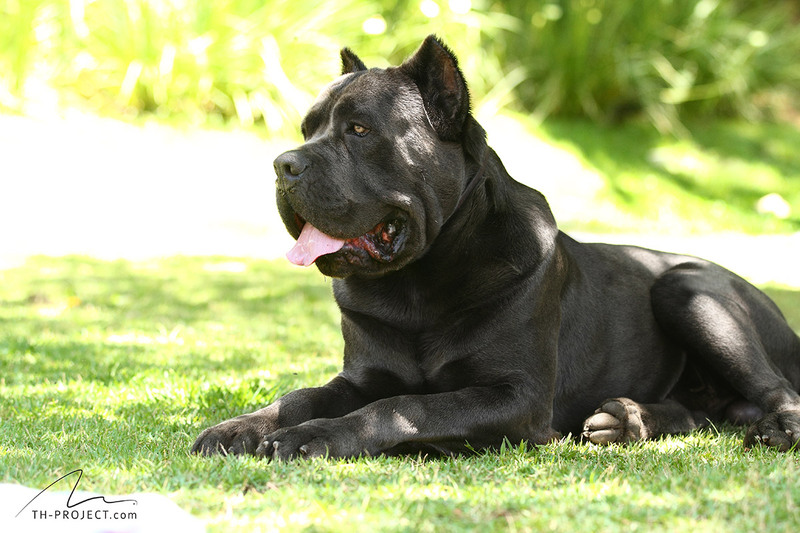 Today, almost 15 years later, I have a stock of cane corsos, most imported from Italy, Argentina and Spain, with the aim of ensuring an excellent bloodline and characteristics in line with the true vocation of the breed: to be a loyal companion to its owner, affable with guests and children, and a ferocious guard of its territory. However, despite the importance of these criteria, I have always and will always use intuition as my guide, as I did when I was taken by a wily black pup that made a home in my lap. Guardian angels are the ones that we choose and not the other way around. And if you’re wondering, I’m still very happy with my country home!